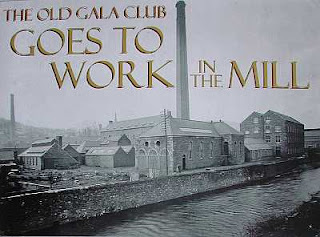 While I was in at Old Gala House, Galashiels today, I saw the Old Gala Club's exhibition, all about the textile mills in Gala, lots of photos of the mills, the machines used, and the processes. The exhibition traces the history of the textile industry in Galashiels and there are a number of unusual artefacts on show. The locations of 23 mills are identified on a map in the exhibition. Old Gala House, is in Scott Crescent, Galashiels, TD1 3JS, Scotland. Map. Don't miss this exhibition, it finishes on Sunday, 18th July 2010. If you're there on a Thursday, pop in and see us, we're in the next room ! To comment on this article, please click the 'comments' link below.